The Gwenaissance continues! Following the debut of Spider-Gwen a year ago, Marvel has seemingly gone gaga for Gwen Stacy. First was Spider-Gwen’s appearance in Spider-Verse. Then she became every Marvel Superhero ever in a series of variant covers. And now, she’s getting another comic... as Gwenpool! 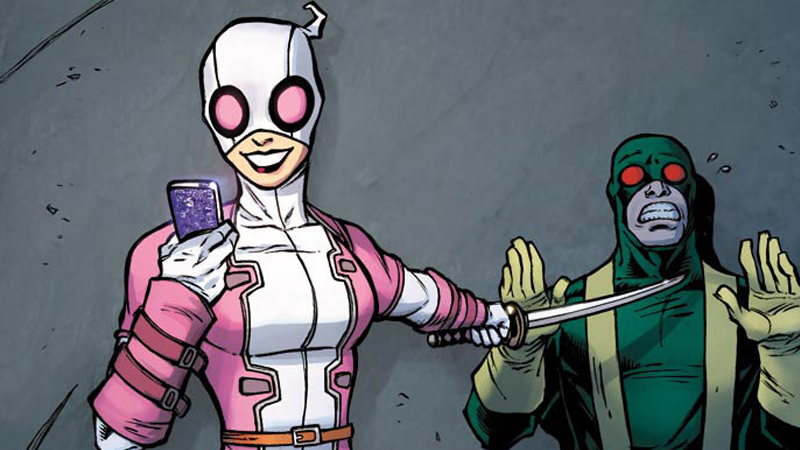 Gwenpool first started out as a variant cover for the excellent miniseries Deadpool’s Secret Secret Wars by Chris Bachalo, but exploded in popularity over the course of the summer con season thanks to some notable cosplays. It seems like Marvel fell in love with her just as much as cosplayers did, because Gwenpool is making a proper return to comics later this year. This second alternate version of Gwen Stacy (the other alternate is of course still Spider-Gwen, off on her own adventures) will first appear in a three-part backup story by Christopher Hastings and Danilo Beyruth included in Chip Zdarsky and Joe Quinones’ new Howard the Duck ongoing, which begins this November. But then Gwenpool will inject a little holiday cheer of her own as she headlines Gwenpool Special #1, a Christmas-themed anthology starring Gwenpool, Clint Barton and Kate Bishop (both as Hawkeye, of course), She-Hulk, Ms. Marvel, Deadpool and more in stories written and illustrated by the likes of Gerry Duggan, Charles Soule, Christopher Hastings, Danilo Beyruth, Langdon Foss, Gurihiru and many others. Secret Wars may be coming to a close soon, but there’s still time for Marvel to acknowledge it: there has to be an alternate Earth out there where every Marvel hero is just a different Gwen Stacy. There has to be. Gwenpool Special #1 will be out in December.